Online references let a third party answer questions and submit comments about an applicant. After you design a reference form, here's how you'll use them in your application processes. Add a new field to the application. Select Online reference as the answer type. Then select the specific reference form you wish to use. After you save the form, the reference field will appear on applications started after that point (it will not be added to any currently in-progress applications). ...Populi will email the reference a link to the online form. Once the reference has been submitted, there'll be a notification on the Admissions Dashboard. Now you process it as you would any other submitted field: you can accept it, reject it, etc. If you need to change anything about the reference, you can do so at any time. Go to the student's application and click the name of the online reference field. Make your changes—you can edit the email address or the message. When you're done, click Save under the message area. To resend the invitation, click delete response; you (or the applicant) can then enter a new email address and note. Click Done in the application field dialog. 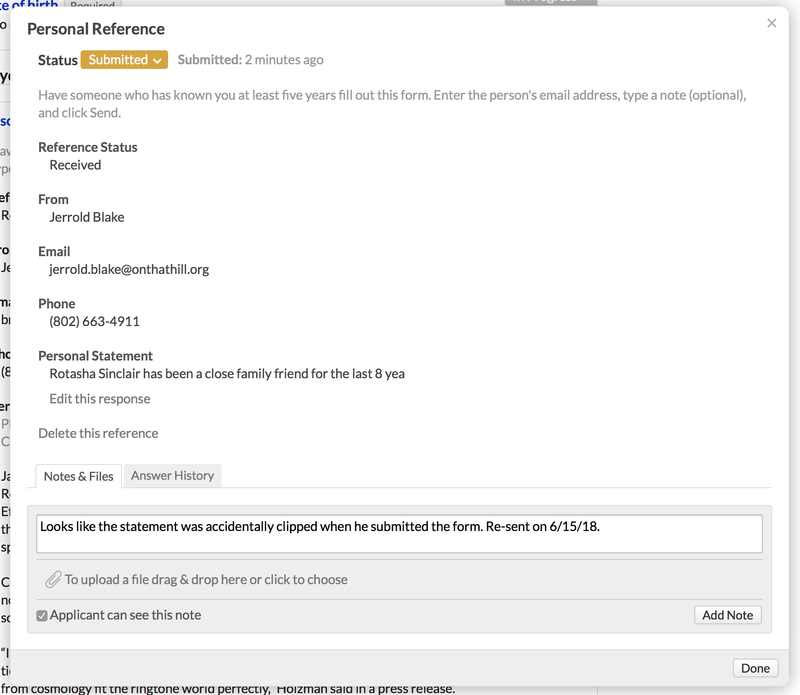 You can wait until the application is submitted to resend the reference invitation, or click Send invitation now. Who can see the reference form? After an online reference is submitted, it can be viewed by anyone with the Admissions, Admissions Admin, Registrar, or Academic Admin roles. The applicant never gets to see the reference—only whether or not the reference person has submitted it yet. The applicant doesn't get to see the reference even after he's accepted and given the Student role.